(PHOTO: THE CHRISTIAN POST)Interior of Castle Church in Wittenberg, Germany, on the eve of the 500th anniversary of the Protestant Reformation. WITTENBERG — American Christians were among the tens of thousands who marked the 500th anniversary of the Protestant Reformation in the city where it all began. Last Tuesday, evangelical Protestants around the world marked the 500th anniversary of the beginning of the Reformation. On that day, it is widely believed that an Augustinian monk named Martin Luther nailed 95 theses to the door of Castle Church in Wittenberg. Luther’s theses objected to, among other things, the Roman Church practice of selling papal indulgences. Church services and speakers commemorated the day in various ways on Oct. 31 and the streets and town square were set up with craftsmen and sellers of all kinds of German foods, beer, and several places where visitors could purchase mulled wine in clay cups. Paige Brinks and Rachel Dieleman, two friends who are recent graduates of Calvin College in Michigan and are both living in Europe for graduate and teaching fellowships, said the journey was spiritually significant for them. “It’s a very interesting feeling knowing Luther was here. I’ve been hearing these stories my whole life but to actually see where he lived and the church where he nailed the 95 theses on, it makes it feel a lot more real,” Brinks told The Christian Post in an interview off the main street in downtown Wittenberg. The two attended the morning worship service at 10 a.m inside All Saints Church (Castle Church), which was mostly in German with certain greetings and scriptures also read in English. The opening hymn was Luther’s famous “A Mighty Fortress Is Our God” (“Ein Feste Burg ist Unser Gott”). (PHOTO: THE CHRISTIAN POST)St. Mary’s Church in downtown Wittenberg, Germany, on Oct. 30, 2017. “It’s neat to think about the progression of society in 500 years and to see how there is still the basis of religion that still exists. Even though we live in a secular culture, in a time that often puts down the foundations, it’s very inspiring to think about our forefathers, how they were religious and how they influenced us to shape culture,” Dieleman said. Danielle Hitchen, the author of Bible Basics who made the pilgrimage to Wittenberg for the Reformation’s 500th anniversary with her husband and two children, said Martin Luther is one of the main reasons why she is now an Anglican. “I started reading Martin Luther’s theology in college as part of our curriculum and Martin Luther talked about the Eucharist and the way it is the climax of the church service and I thought it was so beautiful,” she told CP just outside St. Mary’s church in Wittenberg where Luther often preached. Hitchen grew up in a nondenominational evangelical household but moved to a liturgical tradition in light of the Reformer’s words, a spiritual transition she describes as “the most meaningful theological move of my life,” one which made her faith more real. “It’s amazing to think that this man (Luther) who did so much theological work that continues to have ripples 500 years later walked these streets and preached right here in this church. It’s just amazing to be here,” Hitchen said. The Rev. Michael Kumm, a Lutheran pastor in the Lutheran Church Missouri Synod who chairs the LCMS Board of Directors and is from Dakota Dunes, South Dakota, described the day as a “once in a lifetime experience.” He is also the chair of the International Lutheran Society of Wittenberg. Reformation at 500: Have We Forgotten Its Lessons? “Having been a lifelong Lutheran I have learned about the Lutheran Reformation all my life.” he noted, recounting the “waft of emotion” that came over him as he got to preach the Gospel at one of the services that took place in the city that day. With his wife Janet by his side, he told CP he believes that despite the rise of secularism in the West, God continues to move. “I’m a baby boomer and we were the generation that really started to move away from the church, to be blunt about it. And I see the younger generations coming up today; they are looking, they are searching, they are yearning for tradition, the faithful teaching, the truth. They want to be told ‘what does this mean,'” regarding the Word of God, Kumm said, noting that “what does this mean” was one of Luther’s favorite phrases. (PHOTO: THE CHRISTIAN POST)The famous 95 theses doors of Wittenberg Castle Church on Oct. 30, 2017. David Dickey of Fort Walton Beach, Florida, had been planning to be in Wittenberg for the 500th anniversary of the Reformation for 15 years. A member of the Air Force, he and his family were stationed in Germany 10 years ago and thought then that they must return to Wittenberg when 2017 rolled around. Today, they attend a Presbyterian (PCA) church. “Martin Luther is an awesome example of faith and courage and conviction, which is a very timely message today,” Dickey told CP Tuesday evening, standing a short distance away from the famous Castle Church doors where Luther’s 95 theses were posted. He regards the 500th anniversary of the Reformation as one event in a long series of events over time that represents the movement of God on the earth and throughout the world. “The Church waxes and wanes in various places,” he added, noting that you can see what has happened to Germany since Martin Luther’s day. Over 250 prominent scholars, pastors, and church leaders from around the world released on Tuesday a theological statement affirming the essentials of the Reformation. And its Protestant authors contend that in this 500th anniversary year, the document is a “catholic” statement in its best sense. The Reforming Catholic Confession is a document which outlines the main theological commitments held by a wide breadth of Protestant Christians, including evangelicals, since the Reformation. 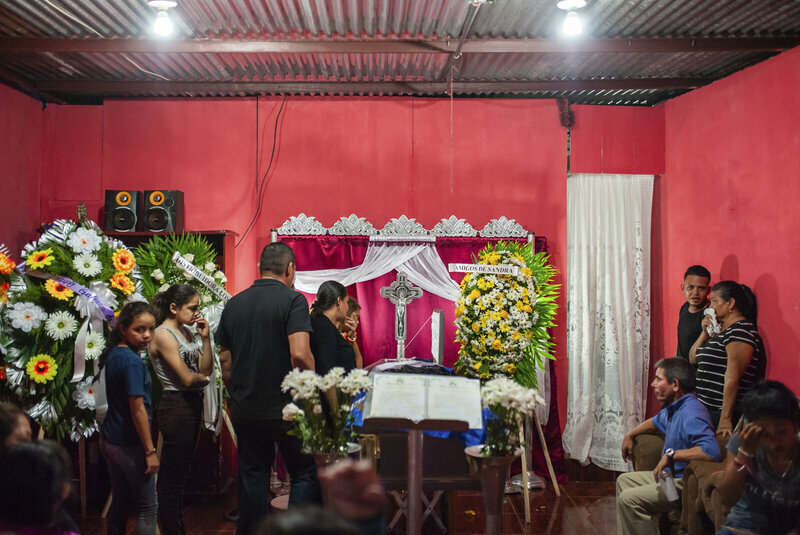 The purpose of such a statement is to demonstrate the remarkable togetherness that exists throughout the world among Protestants on the core elements of Christianity, said Jerry Walls, an author and professor of philosophy at Houston Baptist University. Despite how some Roman Catholics fasten the divisions within Protestantism as a case against it, including the joking about there being 33,000 different denominations — as if the entire legacy of the Reformation is endless religious splintering — the Confession showcases the extensive agreement on the substance of the historic Christian faith, Walls told The Christian Post. The statement’s signatories include a sizable list of biblical heavyweights who hail from a variety of traditions. Over 110 Christian institutions, over 30 of which are international, are represented. (PHOTO: COURTESY OF JERRY WALLS) Jerry Walls, author and professor of philosophy at Houston Baptist University. “I just got the idea that one of the best ways we could actually commemorate the Reformation, and remind people of what really lay behind it and what motivated the Reformers was to come up with a confession of faith that represented the substantial unity among the heirs of the Reformation,” Walls said. He summarily wrote to several biblical scholars and theologians about the idea, all of whom responded favorably, including Kevin Vanhoozer, a professor of systematic theology at Trinity Evangelical Divinity School in Deerfield, Illinois, and author of Biblical Authority After Babel: Retrieving the Solas in the Spirit of Mere Protestant Christianity. As Walls, who is Wesleyan, and Vanhoozer, who is Reformed, began working together and continued reaching out to even more people across the denominational spectrum to join them, the momentum for the project only increased and a palpable excitement was afoot. The Reforming Catholic Confession contains 12 articles that outline their beliefs in such basic Christian tenets as “The Triune God,” “The Atoning Work of Christ,” “The Gospel,” and “The Church,” particularly as it relates to what the Reformers accomplished. The beliefs are followed by 25 “why we say what we say” explanations that capture key cornerstones and dimensions of the Christian faith. 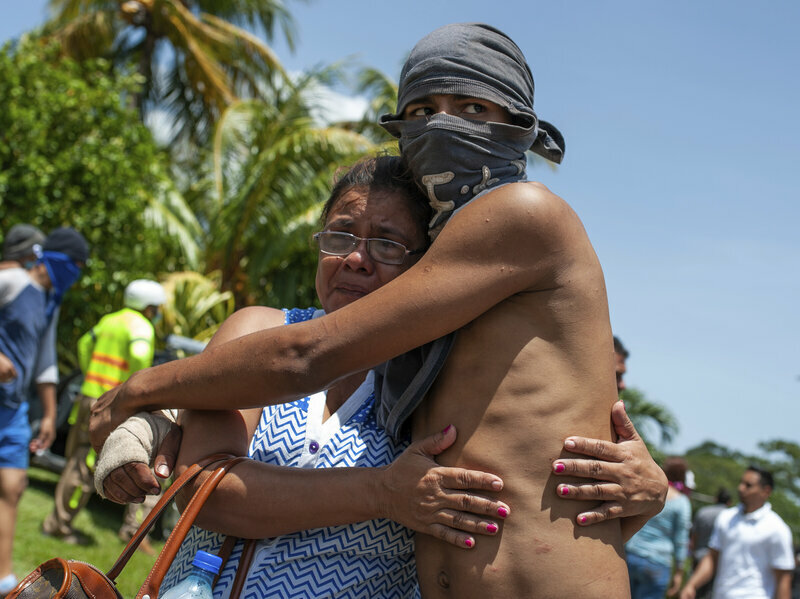 No single group of participants got every single thing they wanted expressed in the document, which underwent multiple drafts and lengthy revisions, but they nevertheless arrived at a mutually agreed upon declaration. “The question was not ‘Does this statement say everything you would want it to say, but ‘Can you agree with us thus far? '” Walls said. The genesis of the statement began earlier this year as Walls was researching for his upcoming book, Roman but Not Catholic: What Remains at Stake 500 Years After the Reformation, which he wrote with Kenneth Collins. One of the things the two authors emphasize is that Protestantism is a better representation of true Catholicism than Roman Catholicism is. (PHOTO: COURTESY OF KEVIN VANHOOZER) Kevin J. Vanhoozer, professor of systematic theology at Trinity Evangelical Divinity School in Deerfield, Illinois. On Oct. 31, Protestant evangelicals around the world will mark the 500th anniversary of the start of the Reformation, when Martin Luther nailed 95 theses to the door of Castle Church in Wittenberg, objecting to corrupt practices of the Roman Catholic Church, most notably the selling of papal indulgences. “A lot of people have been asking the question ‘Is the Reformation over? 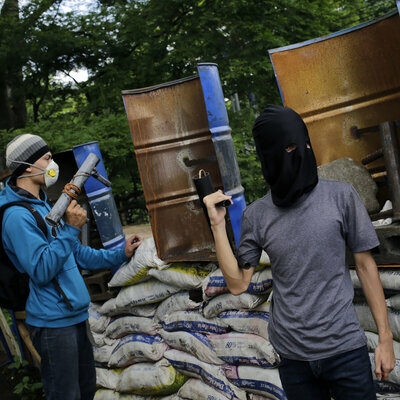 Was it a mistake?” said Kevin Vanhoozer, who took charge of the drafting the initial statement, in an interview with CP. The Reformation was not “a Pandora’s box that unleashed an interpretive anarchy and schism upon the world,” he stressed. Article 2 of the Confession addresses “Holy Scripture” and the line Protestants are famous for: “sola scriptura.” This is the phrase that underpins the Roman Catholic joke about Protestants having tens of thousand of denominational groups due to the variety of ways the Bible can be interpreted without a magisterial authority like the Roman Catholic Church has. “Scripture is God’s inspired and illuminating Word in the words of his servants (Psa. 119:105), the prophets and apostles, a gracious self-communication of God’s own light and life, a means of grace for growing in knowledge and holiness. The Bible is to be believed in all that it teaches, obeyed in all that it commands, trusted in all that it promises, and revered in all that it reveals,” the article reads. As English speakers, “sola scriptura” is frequently misunderstood, Vanhoozer told CP, noting that the phrase is frequently interpreted as “Scripture alone” as though it is somehow “apart from the Church, apart from tradition, and apart from the Holy Spirit.” But “sola scriptura” does not mean that whatsoever when taken in its rightful, theological context, he said. “The Reformers wanted to read scripture with the communion of the saints,” Vanhoozer said, noting how important it was for both Luther and John Calvin to articulate that they were in line with Christian orthodoxy. The phrase “Scripture alone,” he said, does not mean that it is the singular voice people ought to consult but that the Word of God does have supreme authority. 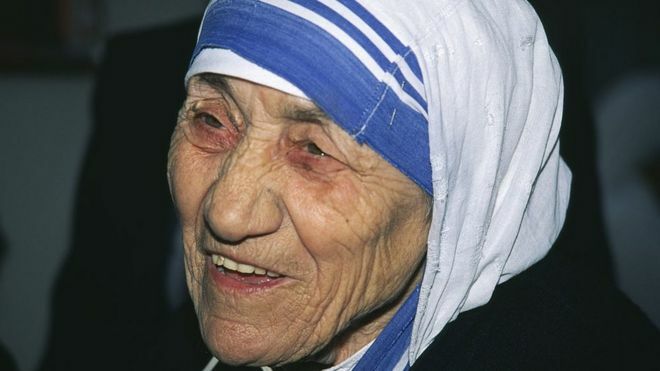 Mother Teresa, who died in Kolkata, India, 19 years ago, will be formally declared a Saint of the Catholic Church by Pope Francis at a Vatican ceremony on Sunday. David Willey, who has reported from Rome for the BBC during five decades, tells how he once spent an hour sitting and talking informally with the new saint in an unlikely setting, the arrivals hall at Rome’s Fiumicino airport. I immediately understood that the woman already known as the “Saint of the Slums” of Kolkata was at the same time a very humble and simple caring person and a sophisticated international traveller. She constantly jetted around the world, visiting her Missionaries of Charity, the religious order she had founded in 1950, so I suppose it was appropriate that we should meet, not in her motherhouse near the Coliseum in Rome, or in one of her hospices for the dying in India, but amid the bustle of an airport. We sat together in the arrivals section and she quickly had me laughing as she proudly showed off her Air India travel pass, which entitled her to a lifetime of free worldwide air travel – a gift of the Indian government. I had been trying to arrange an interview with her for months, but the nuns at her Rome headquarters kept putting me off. Finally they rang me to say she would be arriving on such-and-such a flight from India and departing an hour-and-a-half later to Canada and I could meet her for a brief talk at the airport. She was a tiny figure and her face was already rather wizened. She was immediately recognizable as she emerged alone through the arrival doors clutching a small white cloth bag, dressed in the blue-trimmed white cotton Indian sari and veil which she had adopted as the uniform dress for members of her missionary order. “Do you have to pick up your suitcase as you are in transit?” I asked, feeling slightly foolish for suggesting that a living saint might misplace her baggage tag. Before tackling more weighty metaphysical and theological matters and hearing how she devoted her life to the poorest of the poor, I decided to try to find out more about how a living saint organised her travels. I was intrigued by her Air India free travel pass. “How do you plan ahead?” I asked, in the pre-mobile phone era. “Well I usually ring up, from a coin box at the airport, the head of state or the prime minister or Pope John Paul at the Vatican if I am in Rome – and they send a car to the airport to meet me,” she said. 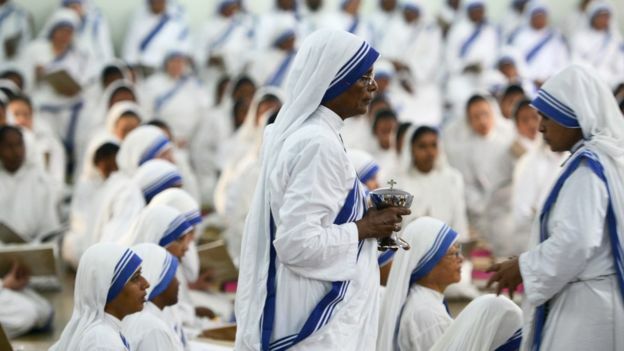 By the time I met her in the late 1980’s, Mother Teresa’s sisters and affiliated brothers and fathers had already grown to become an international family of 1,800 nuns and many thousands of lay workers. Today they number nearly 6,000 and are active in 139 countries. Her order knows practically no territorial boundaries and she was already setting up homes and hospices and recruiting in Eastern Europe long before the fall of the Berlin Wall and the end of the Soviet Union. She opened two centers in Hong Kong as early as 1983, but China has so far resisted attempts by the order to minister to their poor. 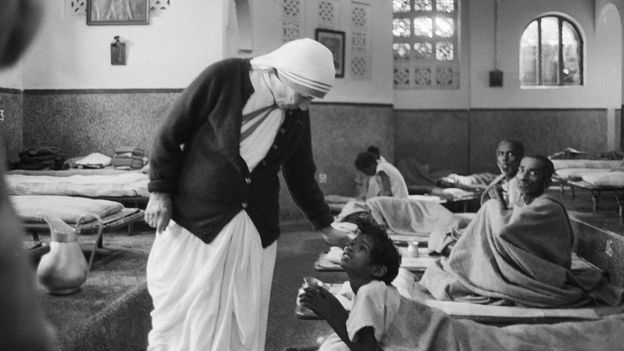 As the minutes ticked by, Mother Teresa went on to explain to me her single-minded devotion to her work of ministering to the sick, the dying and the disabled. 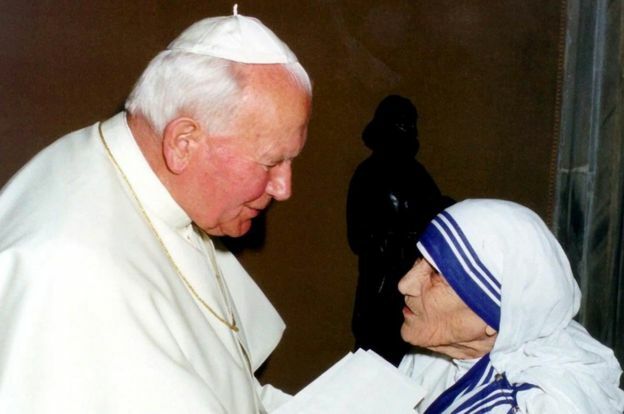 Pope John Paul II had visited Mother Teresa’s hospice for the dying in Kolkata during his pilgrimage to India in 1986 and the two became close friends. Mother Teresa frequently appeared at Vatican ceremonies at the Pope’s side until her death. Later, in record time, in 2003 she was herself created a Blessed of the Roman Catholic Church, marking her final step towards full sainthood. Her flight to Toronto was called and we walked together to the departures hall. She disappeared behind the automatic doors, still clutching her small cloth bag and passing unrecognized, it seemed to me, among the throngs of passengers crisscrossing the transit zone. I knew I had met a living saint; she had touched my heart, transmitted her sense of joy for life, and she had also made me laugh.